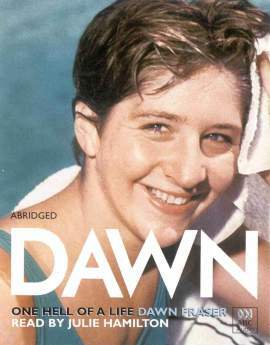 Dawn Fraser : Olympic Gold Medallist : Official Site. Dawn Fraser AC MBE OLY is Australia’s greatest Olympian. In November 1999, Dawn was awarded “World Athlete of the Century” at the World Sport Awards in Vienna. In the same year was also awarded “Athlete of the Century” by the Australian Sports Hall of Fame. She was voted the person who best symbolises Australia and in 1998 was included as one of Australia’s National Living Treasures. Dawn Fraser’s sporting accomplishments are unlikely to be repeated - in swimming or any other sport. She is an international phenomenon: a multi-Olympic and Commonwealth Games Gold Medal winner whose success stretched over fifteen magnificent years. During her career she broke and held 41 World records and was undefeated over 100 metres freestyle. Born in the Sydney suburb of Balmain, Dawn is the youngest of eight children from a working-class family. In 1952, her awesome swimming ability was noted by coach Harry Gallagher, who took over the training of the broad-shouldered teenager and set the 1956 Olympics in her sights. In 1955 Dawn won her first Australian title in the 220 yards freestyle and, during that summer season, went on to re-write the record books: setting new Australian records in all freestyle events up to 880 yards. At the 1956 Melbourne Olympics she became an Australian national hero and world swimming star, winning the 100 metres freestyle gold medal in world record time as well as taking gold in the 100 metres freestyle relay and silver in the 400 metres freestyle. Dawn won two more gold medals at the 1958 Commonwealth Games in Cardiff, Wales, and another gold at the Rome Olympics in 1960 for the 100 metres freestyle. By this time she had attained the status of a legend, in the first rank of Australian sporting heroes. Yet then, as today, she remained untouched by her fame. After winning four gold medals at the 1962 Commonwealth Games in Perth, Dawn finished her international swimming career at the Tokyo Olympics in 1964 silencing her critics by winning a gold medal in the 100 metres freestyle at the age of 27. Taking her total Olympic medal count to four gold medals and four silver medals. She has continued to give back to her sport and other sports by being mentor for Able and Disable Australian Olympic Teams since 1988. Autobiography “DAWN ONE HELL OF A LIFE”. Published by Hodder Headline Australia. Twenty years later Dawn returned to the public life as an independent member of the New South Wales Parliament. She has since maintained an active role in the sporting and wider community as Patron of the Cerebral Palsy Sports Association, the Wheelchair Sports Association of Victoria and of the Ladies Professional Golf Association. Is a Founding Member of the Laureus Sports Academy, a member of the Sport for Good Foundation and Vice President of the World Association of Olympic Winners, while continuing to support sporting clubs across the country. She is also a member of the NSW Sports Advisory Board and is a Director of the Wests Tigers Football Club, Balmain Leagues Club and Balmain Football Club. At the 1996 Atlanta Olympic Games Opening Ceremony, Dawn was honoured by the Atlanta Olympic Organising Committee as one of seven greatest athletes of all time and also carried the Olympic torch on its way to the main stadium. At the 2000 Sydney Olympic Games, Juan Antonio Samaranch, President of the International Olympic Committee made Dawn, First Lady of the Olympic games partnering him to the Opening Ceremony in which she was one of seven Australian women to run with the Torch in the main Stadium. She also was the Attaché to the Australian Olympic Team in 2000. She remains one of Australia’s best-loved identities. This and more information is documented in an Autobiography that she wrote called “DAWN ONE HELL OF A LIFE”. Published by Hodder Headline Australia.